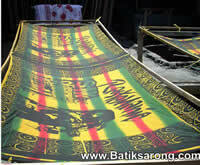 Bob Marley Sarongs from Bali Indonesia. online catalog of rasta sarongs and jamaicans sarongs. Silk screen print sarongs with bob marley or Jamaican motifs. All by CV MAYA, sarongs manufacturer in Indonesia. 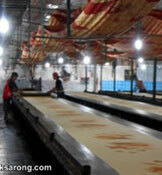 Producer manufacturer and exporter of sarongs. 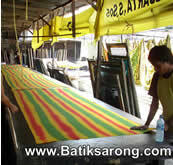 Rasta Sarongs factory Bali. CV Maya produce and export all kind of rayon sarongs including the solid color beach sarong with sea shells. This is plain sarongs with sea shells for the fringe. Sarongs made in Indonesia direct from sarongs company in Bali Indonesia. If you need sarongs supplier and sarongs wholesaler in Bali Indonesia, please contact us. Price Rp 21,000 EXW. Subject to change. Retail Price. Batik Sarongs with Sea Shells. 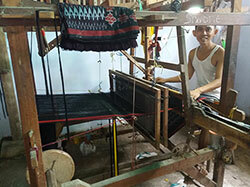 Sarongs Made in Indonesia Looking for batik garment manufacturer ? batik manufacturer company? 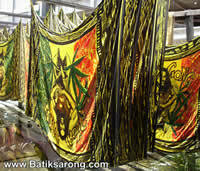 BatikSarong.Com is a batik manufacturer company located in Indonesia. Are you beach wear apparel fashion distributor looking for batik textile, batik sarongs, batik pareos, batik garment made in Java Indonesia? You've come to the right place! BatikSarong.Com owned by CV Maya CV MAYA Tax id: 02.612.185.5-903.000. A manufacturer and exporter company for batik beach sarongs located in Indonesia. Beachwear and sarongs made of rayon fabric with batik motifs. All made in Indonesia. Good quality reasonable price, direct from the pareo factory. Need help ordering our beach pareo and sarongs ? Contact us now, we give prompt reply ! Visit our shop in Bali ! Sarung goyor factory in Indonesia. Buy handmade sarong goyors direct from Indonesia. Contact us by email or WhatsApp for more information regarding our sarung goyor, also known as sarung tenun, macawis, izaar or futah. High quality handmade sarungs direct from factory.